I learned a very important lesson yesterday. I cannot go two days in a row without running, unless there’s a very good reason why I can’t. Yesterday I ran after a two day break because of the weather. It sucked so hard. I felt weighted down and like I had less energy to make it through. Although, I did do a full 35 minutes of interval training. Today was a little easier but for some reason my right calf felt like it seized up and my left ankle decided to protest 3/4 of the way through the run. I kept going but I only did 30 minutes today. Things are feeling better now but today wasn’t easy. This time last week I had taken the day off for a rest but since I skipped Sunday’s training I decided to run today. This week is a busy week for us and my training schedule has to be different. So tomorrow I’ll be running again so I can take Thursday off. Thursday is going to be busy and I won’t be able to run that day. I have an appointment Thursday morning with the counselor at my son Lock”s (14 year old son) school to go over his 9th grade and high school schedule so we can prep for college. Then that night Jack has a third grade performance but I’m thinking he’s probably not going to be going because he woke up ill today. He started running a fever a few hours ago, so no school again tomorrow. I think it’s just a small cold but I’m keeping an eye on it. He’s the one out of all my kids who gets really sick no matter what. You sneeze on him and he gets a cold, cough on him and he gets an infection. It’s crazy. So, I’ll be putting on my nurse’s cap tonight and tomorrow to make sure his fever stays down. I hate it when my kids get sick, no matter how old they are. So, today while I was running and the pain began I had to keep reminding myself to keep going. In fact, at one point I had Ellen Degeneres’ voice in my head singing,”just keep swimming, just keep swimming, just keep swimming, swimming, swimming”. It helped actually. And I had to push today just to get in the full 30 minutes of training. Don’t let anyone ever tell you running is easy. If anyone ever says that to you, look them straight in the eye and then smack them. They have no idea. And they won’t see the smack coming if you’re lucky. I’m in good condition for the most part and it’s still hard. What gets me through days like today, and yesterday especially, is the thought of what I’m doing all of this for. I’m going through all of this pain to become a better me, to make sure my kids have their mom around for as long as I can be here, and to prove to myself that I can do anything I put my mind to. This run I am doing is more than just a run to me. It’s my reward for all of this hard work, the proof that I was able to change my negative thinking into positive. April is pretty far away still, but I know how quickly time can pass. Currently, I cannot run a full 30 minutes. This is why I am doing the interval training. It’s why I”m spending eight weeks doing it and increasing my level of activity and the length each week. Yesterday was one of those days that make me question my belief in myself and, yet, I prove every day to myself that I can do it, that my will power is stronger than the pain. 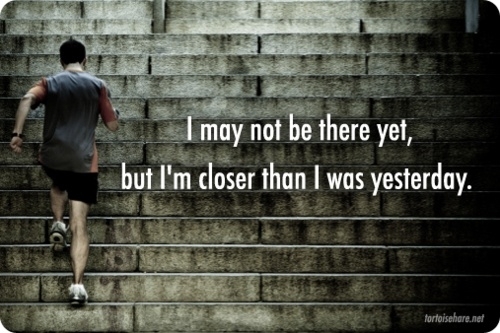 My confidence increases, my belief in my abilities increases, and I get closer every day to reaching my goals. Every day is one day closer to them. It doesn’t matter that today I felt slow. It doesn’t matter that I didn’t get a 35 minute training done. What matters is that I got out there and I ran. I’ll do it again tomorrow, and I’ll keep doing it no matter what obstacles get in my path. I want to be strong physically as well as emotionally, and I will get there. I already am getting stronger. Each day proves that as I progress along my path. It’s February now. Are you still keeping up with your New Year’s resolutions or have things become too difficult? Can you keep going or have you become discouraged? I’ve been thinking more and more about joining a gym and seeing what else I can do to help myself. I need to be able to train on bad weather days and currently that prohibits me from doing much then. Kids are the other distraction from training indoors. Plus, I think it will help encourage me to see others who are working out as well. If you are getting discouraged from obtaining your goals, try joining people who are working on the same goals. I promise you it’s a real boost. It’s good for your spirit and morale. Look around and see places you can join something and go be around like-minded individuals. But above all, keep going. Just keep going. You’ll never get any closer to what you want if you just sit there. You won’t regret the hard work you put in, but you will regret not doing it.